Review: By at least 2015 I see John Dickson’s books being made into movies. 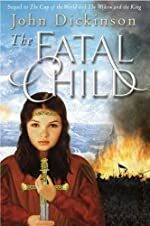 That’s right I said “books” and “movies” because this book, The Fatal Child, is the third book in the series with two other books entitled The Cup of the World and The Widow and the King. The Fatal Child is about two main characters, Padry and Melissa. Padry is in the army and in high position working for the king. Melissa is a young five year old girl living at home with her Mam and Dadda. Tragedy strikes for both of them. For Thomas Padry his friend and practically daughter, Atti, wakes up one morning from a dream about Ambrose, otherwise known as the “Prince of the Sky.” So she sets off on an adventure, without telling anyone were she is going, to find him while she is only 14 and her only companion is a sickly maid. So Thomas must go on an adventure to rescue her with only 1 friend to accompany him. They must use witchcraft to find her, even though it is strictly forbidden throughout the kingdom. Meanwhile in Melissa’s life things aren’t doing to good for her either. Melissa is at home with her Mam and Dadda when they get two visitors late at night. Melissa finds out that the visitors are Ambrose and his servant and befriends Ambrose. But Ambrose and his servant must leave so Melissa keeps waiting for them to show up again. They never did come again. Later Melissa is around the age of 10 or 13 and ten knights in red clothing come to their house. Mam and Dadda are against them so the knights attack. They took Dadda, tied a rope around his neck and hung him, kicking and screaming. While they killed Mam and left her lying dead, stripped of clothes next to the river. Melissa barely escapes with the knights laughing and shooting arrows at her as she runs through the trees. She ends up passed out upon the dirt road and is carried to a house. She ends up staying there with Atti and her maid. Now Melissa, Padry and Atti end up at Ambrose’s trial. You want to know what happens next? Then read the book! When I read The Fatal Child, I personally thought it was a bit to...gruesome. Here is an extract from the story, “They had seen a babe still mewing bloodily on the point of a pike.” I would say they don’t need to go in to so much gruesome detail, but that’s just me. I mean it’s rated for teens (appropriately rated) and I’m only 11 so I’m a bit young to read it. Thomas Padry was a good character and his humor always brightens up the most dreary of moods. Though he’s a bit sarcastic and feisty. He is a great character in the story. Melissa is a great character too. She may have her moods, though but that’s the way I like it. She has an unforgiving hungry for revenge on the knight for killing her parents and in The Fatal Child it states that she was thinking “- squeeze his eyes out” because she thinks it would be a right punishment for him. She is my favorite character and adds spice to The Fatal Child. The Fatal Child goes back to before technology and is fictional with princes and princesses and they all live in a place called Tuscolo. I would say The Fatal Child is a book to never leave until the very end of it. So I would say if you are an adventurer, action and witchcraft lover The Fatal Child and its series would be paradise to you. This is a new release book so it didn’t get any awards yet, but I’m sure it will soon. I’m sure I liked it. They used some language back from the older days that I didn’t really understand but thought was cool at the same time. I would give The Fatal Child four out of five stars. We would like to thank Random House for providing a copy of The Fatal Child for this review. Have you read The Fatal Child? How would you rate it?